SHARON, Penn., Feb. 5, 2019 /Christian Newswire/ -- Jim and Amy Schneider started Eyes of Faith 10 years ago. 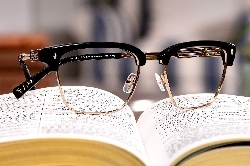 Their vision was to create stunning eyewear with inspiring messages on each style. Now, the first Christian eyewear company continues to blaze a trail by offering new ways to purchase their designer glasses and sunglasses, making them accessible to virtually anyone throughout the U.S.
For the past decade, EOF's wholesale eyewear business among eye doctors has grown immensely, with high-quality eyewear that features custom details, the latest fashion trends, and most importantly, uplifting Bible verses. The Biblical scriptures printed inside every frame are a faithful reminder to wearers to focus on God's vision and to "See Life" through Eyes of Faith. EOF eyewear is available at more than 500 optical stores nationwide. Now, as a convenience, EOF shoppers can go online to create a try-on kit at eofoptical.com to send directly to their nearest participating optical retailer. Or, in the absence of a nearby store, they can use state-of-the-art virtual try-on technology and simply purchase any frame from the brand's entire collection directly from the website! As a socially-conscious, faith-based company, Eyes of Faith also spreads the Word through their philanthropic Wear & Share® program: a portion of every purchase supports Christian missions that deliver the gift of sight to people in need where people receive a free eye exam, prescription glasses, readers, or sunglasses according to their needs and the hopeful message of Jesus Christ. These clinics are arranged domestically and abroad for people who have little or no access to eye care, and typically, have never heard the Gospel message. Co-founder Amy Schneider is thrilled that the company's mission and products can now reach a broader audience, saying, "For the past 10 years, our customers have loved our designs, values, and the fact that Bible verses are included inside every frame. So, we're incredibly excited that anyone who wants to wear Eyes of Faith glasses will now find a way on our website." Eyes of Faith is the only designer of Christian eyewear, founded in 2008 with a purpose to show the love of Christ. Bible verses are printed inside every Eyes of Faith frame, and a portion of each purchase supports Wear & Share® missions, where people in need experience the love of Christ through the Gospel message, and free eye exams, glasses, sunglasses, and readers. Learn more about Wear & Share® missions and all the ways to purchase EOF eyewear at eofoptical.com.